Ce document au format PDF 1.5 a été généré par Adobe InDesign CS6 (Macintosh) / Adobe PDF Library 10.0.1, et a été envoyé sur fichier-pdf.fr le 24/11/2014 à 12:18, depuis l'adresse IP 105.155.x.x. La présente page de téléchargement du fichier a été vue 385 fois. Taille du document: 290 Ko (11 pages). 2 Private Practice, Atlanta, Georgia, USA. 515 Delaware Street SE Minneapolis, MN 55455, USA. 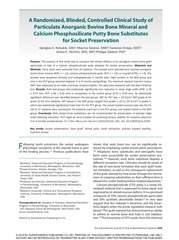 ©2014 by Quintessence Publishing Co Inc.
shown that early bone loss can be significantly reduced by employing socket preservation procedures. © 2014 BY QUINTESSENCE PUBLISHING CO, INC. PRINTING OF THIS DOCUMENT IS RESTRICTED TO PERSONAL USE ONLY. NO PART MAY BE REPRODUCED OR TRANSMITTED IN ANY FORM WITHOUT WRITTEN PERMISSION FROM THE PUBLISHER. attributes of the grafted bone in those sites. day were included in the study, and they were encouraged to abstain from smoking beginning a week before surgery and continuing for 4 weeks after surgery. measurements were recorded on the day of surgery. by the same examiner, and the mean of the two measurements was reported. CEJ was considered the reference point. Fig 3 Atraumatic handling of the socket during extraction allowed for preservation of the soft tissue architecture of the area. characteristics of putty materials allow for the filling of the socket in a single step, in contrast to particulate bone substitutes. moldable when it comes into contact with blood. socket thanks to the flow of the putty. and completion of atraumatic tooth extraction as previously described (Figs 2a and 2b). avoid bidigital compression of the postextraction sockets, as this might lead to excessive bone loss27 (Fig 3). socket. A postoperative periapical radiograph was taken to verify the socket fill in the test groups (Fig 6). postextraction. Adequate bone width preservation is evident. be seen to resemble that of the neighboring pristine bone. months by the same blinded examiner who had performed the baseline measurements and was not involved in the surgical treatment (Figs 7a and 7b). and was gradually increased in 5-N/cm2 increments until the implant was fully seated in the desired position. minimum of 12 months postloading. bone substitute as in the BOV group.5 Normal distribution of the data was assumed for the power analysis. whereas the control group included 6 extraction sites. maxilla and 16 were in the mandible (Table 1). was noted for the PUT and BOV groups, respectively. for all groups are presented in Table 2.
the area and prevented fracture of the buccal plate. is premixed and readily available for application intraorally. with ABBM to the level of the bone crest. recorded at 5 months postextraction. three in grade 3, three in grade 2, and one in grade 1. *This site was removed from MIT comparison because it extended more than 3 mm into native bone at the time of implant placement. Fig 10 Primary implant stability grades for all implants included in the intergroup comparison from each of the test groups. (P &lt; .05) (Table 3, Fig 10). 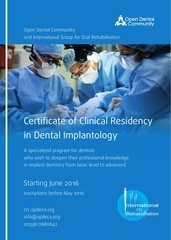 The overall implant success rate was 94.1% (16/17). postloading success rate of 100%. when reviewing results from these measurements. its reliability and ease of clinical use. The need to quantify the findings of this study and assist future researchers led the current authors to introduce the MIT index. A limitation of the present study includes the location of the healed sites where implants were placed. based on the MIT index. primary stability can be achieved (Table 4). suggested for transitional socket preservation. putty are required to verify the present findings. materials that were used in this study. entity. J Prosthet Dent 1971;26(3):266–279. 25 years. J Prosthet Dent 1972;27(2):120–132. 5. Cardaropoli D, Tamagnone L, Roffredo A, Gaveglio L, Cardaropoli G.
Socket preservation using bovine bone mineral and collagen membrane: A randomized controlled clinical trial with histologic analysis. Int J Periodontics Restorative Dent 2012;32(4):421–430. evaluation. Compend Contin Educ Dent 2012;33(8):e109–115. combination with autogenous bone graft. Dent Res J 2005;2(2):1–9. introduced natural bone regeneration (NBR) concept utilizing alloplastic putty. Int J Oral Implantol Clin Res 2011;2(3):145–149. 500 days of follow-up: Preliminary results of 12 consecutive patients. J Oral Maxillofac Surg 2012;70(6):1321–1330. follow-up. Clin Oral Implants Res 2013;24(6):599–605. 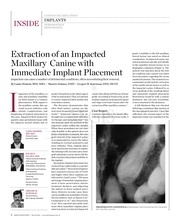 J Oral Maxillofac Implants 1999;14(6):835–840. 18. Artzi Z, Tal H, Dayan D. Porous bovine bone mineral in healing of human extraction sockets: 2. Histochemical observations at 9 months. defects treated with Bio-Oss. An experimental study in the dog. Clin Oral Implants Res 1997;8(2):117–124. results from a multicentric randomized clinical study. J Oral Implantol 2012;38(3):239–249. technique and review of the literature. J Oral Implantol 2012 Nov 12. 28. Esposito M, Grusovin MG, Achille H, Coulthard P, Worthington HV. dental implants. Cochrane Database Syst Rev 2009(1):CD003878. bovine-derived xenograft: A randomized, controlled clinical trial. Clin Oral Implants Res 2010;21(7):688–698. implant placement. Clin Adv Periodontics 2011;1(2):118–131. and clinical implications. Periodontol 2000 2008;47:51–66. A laboratory study. Clin Oral Implants Res 2009;20(4):327–332. implant bed: An in vitro study. J Prosthet Dent 2012;107(6):366–372. trial. Eur J Oral Implantol 2011;4(4):329–344. PI, Zarb GA, Albrektsson T (eds). Tissue-Integrated Prostheses: Osseointegration in Clinical Dentistry. Chicago: Quintessence, 1985:199–209. implant stability. 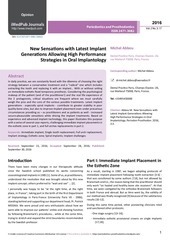 Int J Oral Maxillofac Implants 2012;27(4):945–956. model for bone graft success. Implant Dent 2012;21(4):295–301. Ce fichier a été mis en ligne par un utilisateur du site. Identifiant unique du document: 00282049.